‘Ancient Amerindian Symbols with Old World Connections’ will be featured at yearly book fair. He hopes that this book will help readers gain some understanding of the world around them and see that there is more to learn than what the history books claim to tell them. 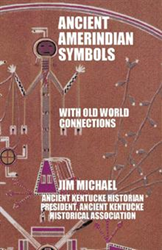 In “Ancient Amerindian Symbols with Old World Connections” (published by Trafford Publishing), author Jim Michael’s latest historical book, readers follow Michael as he takes them around America to find ancient symbols and their history. His book will be featured at the 2014 New York Library Association, a yearly book fair that draws in thousands of attendants each year. As readers progress through this collection of ancient lore and symbols, Michael points out that many of the symbols seen around America have been here long before Columbus graced the eastern shores. He hopes that this book will help readers gain some understanding of the world around them and see that there is more to learn than what the history books claim to tell them. James B. Michael obtained a general science and pre-med degree from the University of Iowa, as well as minor degrees in education and psychology. He graduated from the University of Louisville with a degree in counseling, anthropology and archaeology. He served in the National Guard and Reserve for 44 years and was with Pfizer Pharmaceuticals for 33 years.